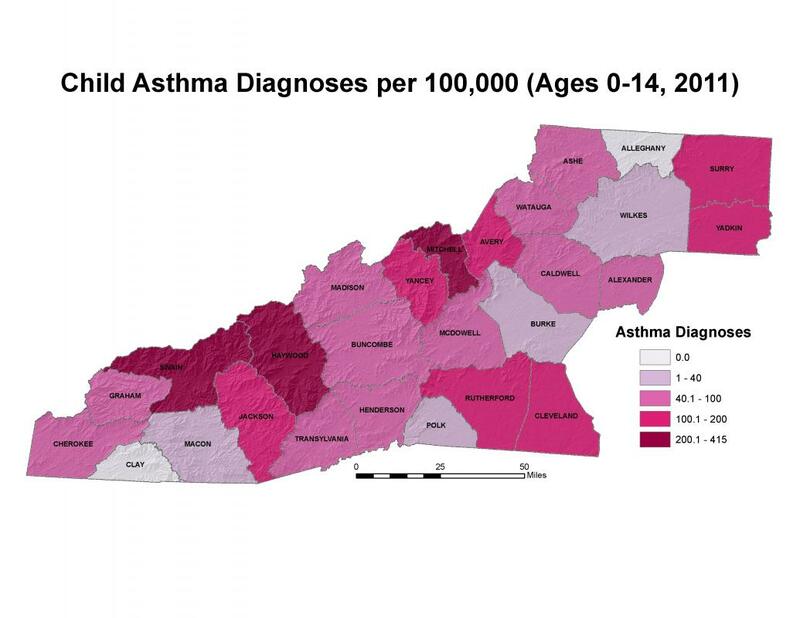 For every 100,000 children in North Carolina, about 157 have childhood asthma, but in the Mountain Resources Commission (MRC) region only 93 children per 100,000 have childhood asthma. Compared to the region’s average rate of childhood asthma, Mitchell County's rate is 126 percent higher, Haywood County's rate is 98 percent higher, and Swain County’s rate is 82 percent higher – all likely due to air pollution from power plants and industry carried by prevailing westerly winds. The childhood asthma rates referenced here are based on the number of North Carolina hospital discharges with a primary diagnosis of asthma for patients age 0-14. Note that the data includes only North Carolina residents served in North Carolina hospitals, and that the rates indicated may be lower than actual rates in counties that border other states. For more information about asthma, see Asthma Occurrence. Infant mortality is the death of a child less than one year of age. The infant mortality rate (number of infant deaths per 1,000 births) for the period 2007-2011 in the MRC region was 7.1 – slightly less than the North Carolina rate of 7.8. The highest infant death rate in the region for this period was in Clay County, with a rate of 12.3 – 44 percent higher than the statewide rate. Also during this period, two MRC-region counties had the lowest infant mortality rates in the state: Mitchell and Ashe Counties, with only 2.6 and 3.0 deaths per 1,000 births, respectively. In 2011, the leading causes of infant mortality in North Carolina were certain conditions originating in the perinatal period (including complications of pregnancy, labor, and delivery, birth trauma, and infections), prematurity and low birth weight, and congenital malformations, deformations, and abnormalities. Childhood obesity in the MRC region is slightly higher than in the State of North Carolina as a whole. In 2010, the percentage of children aged 2-4 in the MRC region who were overweight or obese was 31.9 percent, compared to 31.7 percent for the state. Alleghany and Graham Counties had the highest childhood overweight/obesity rates in the region, at 40.2 percent and 38 percent, respectively, while Madison County (22.7 percent) and McDowell County (22.2 percent) showed the lowest rates. For more information about obesity, see Obesity and Diabetes. Many of the rates mentioned here have numerators smaller than 20. Any rate with a small number of events in the numerator will have substantial random variation over time (a large standard error) – a good rule of thumb is that any rate based on fewer than 20 events in the numerator may be subject to serious random error. Therefore, caution should be taken when making comparisons or assessing trends with rates calculated with fewer than 20 events. For a detailed discussion of Problems with Rates Based on Small Numbers, refer to Statistical Primer No. 12 of the North Carolina State Center for Health Statistics, available from their website or by request. North Carolina Department of Health and Human Services, Division of Public Health, Nutrition Services Branch, North Carolina Nutrition and Physical Activity Surveillance System. Accessed from: http://www.nutritionnc.com/pdfPregPed/ncpass/2010/TableCountyObesityRates.pdf. North Carolina Department of Health and Human Services, State Center for Health Statistics. 2011 Infant Mortality Statistics for North Carolina. Accessed from: http://www.schs.state.nc.us/schs/deaths/ims/2011/. North Carolina Department of Health and Human Services, State Center for Health Statistics and the Office of Healthy Carolinians/Health Education. December 2012. 2013 County Health Data Book. Accessed from: http://www.schs.state.nc.us/schs/data/databook/.